นางกวัก /naang gwàk/ is a lady spirit who is traditionally believed that whoever has her in will enjoy brisk business through its mysterious attraction. 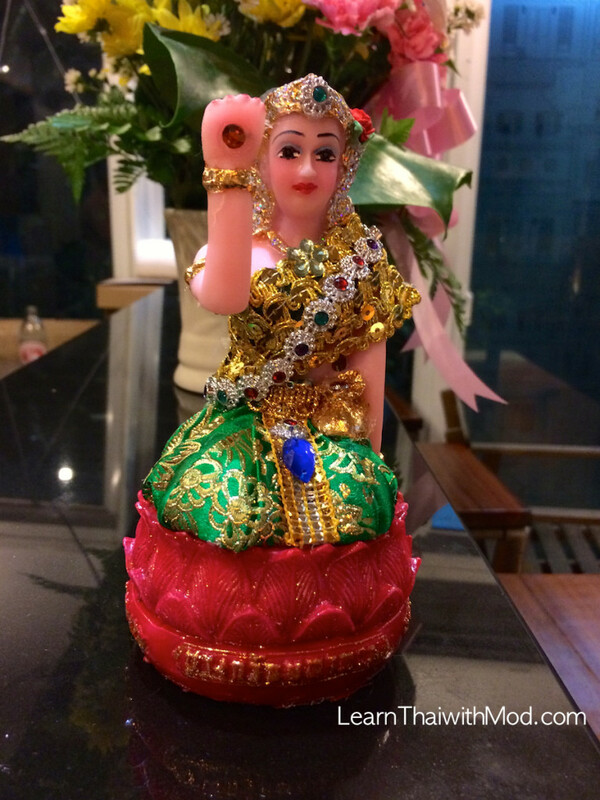 The Thai Legend of Nang Kwak is highly revered as the Goddess of Wealth or Patron Saint of all Merchants. 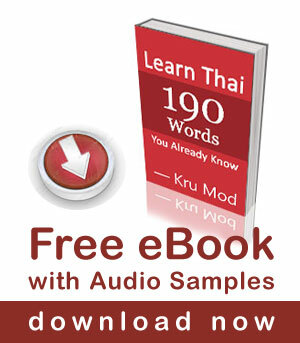 Nang Kwak is one of the best known legend in Thailand that dates back before Buddhism even reach Thailand. The hand of the charming Nang Kwak sometimes dubbed “Miss Inviting” is held up in beckoning gesture to call upon luck, fortune and wealth to come to the worshipper or merchant. This spirit is supposed to bring wealth to the household and is particularly popular with shopkeepers. The spirit is dressed in traditional Thai costume, also wears a golden crown on her head and is in the sitting or kneeling position. On her left hand is a money bag and her right hand is lifted up. She is either beckoning customers to come into the store or asking for wealth to come her way with her posture. She also wears a golden crown on her head and is in the sitting or kneeling position. Thai people like to have a figurine or cloth poster (Phayant or Yantra Cloth) of this goddess in their home or shop, where it is often placed by the shrine. Some people also wear amulet talismans with her figure around the neck, which is a logical development due to the fact that many people in Thailand must travel around to sell their wares. This makes a portable Nang Kwak amulet as a practical choice for this reason. If you would like to improve your finances and increase sales then Nang Kwak will be always there to offer assistance. Pay due reverence to the Goddess of Wealth and repeat the following Katha mantra. Your generosity and good deeds in making merit will be rewarded. One should use 5 incense sticks and offer flowers, red syrup drink (sala flavour known as “nam daeng” in Thai) or alternatively Fanta bottled drink. From my study observation, you may also include Red color lipstick, water, flowers, sweets, fruits and rice as offerings to Nang Kwak. Please be deligent in changing the water drinks and food offerings every morning when you open your shop for business. When you show your pampering devotion and love, she will return a favor by bestowing upon good sales and fortune to you. After lighting the incense sticks, recite Namo Tassa Bhagawato Arahato Samma Sambuddhasa 3 times before begin chanting the main Katha. Have you ever seen this in Thailand? My fiancée has Nang Kwak in her home in BKK. I’m glad I now understand. Thanks for the story. She has a hair salon, so it makes sense. “Namo Tassa Bhagawato Arahato Samma Sambuddhasa ” is from Buddlism Sutra Na Krup. I saw plenty of those golden waiving fortune cats in shops everywhere and even met an nang fah wan 55. How did I miss nang gwak ??? Hi Mod, can tell me how to recite the main katha for Naang Gwak?